At 8:00 a.m. ET today, June 14, the Bureau of Engraving and Printing (BEP) will release a set of three $2 bills with matching serial numbers that begin with "2017." 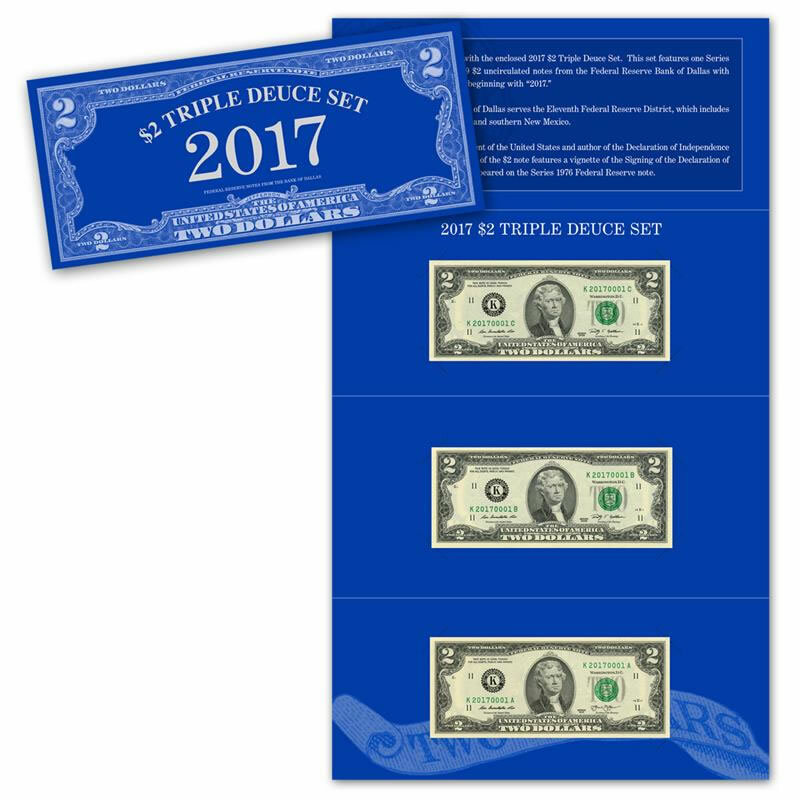 Named the 2017 $2 Triple Deuce Currency Set, interested money collectors should order it as soon as possible because these types of products tend to sell quickly. Limited to 3,500 worldwide, sets are priced at $59.95 each. If any remain available after the pre-release period of June 14 to 20, the BEP will offer bulk-pricing of $54.95 for quantities of five or more. The per-household ordering limit of 5 sets would also be waved on June 21. 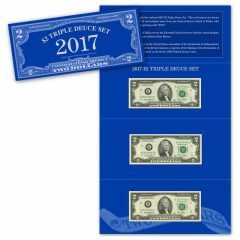 Inside the 2017 $2 Triple Deuce Set’s four-panel presentation folder are a Series 2013 and two Series 2009 $2 uncirculated notes from the Federal Reserve Bank of Dallas. Each Federal Reserve note is protected by a clear acid-free polymer sleeve. When released, the set may be ordered online by visiting the BEP’s website at www.moneyfactorystore.gov. For me to pay that much they would have to be at least star notes and/or low serial numbers! Good lord, what a deal! Where else in the world can I buy $6.00 worth of US currency for $60.00? It’s going fast boys, better get yours while you can. Look for other great deals while your on the BEP site. And we have a Federal deficit, with these profit margins I don’t see how! Yep, I’ll take 20 sets! That’s $120.00 for only $1200.00, what a steal! Such a deal, anyone looking for some nice oceanfront property in Montana? Priced too high. Should be about $29.95 and they would still be making a huge profit. Just my 5995 cents worth. This is a joke……10x face now for new fed notes, goes along with the Mint’s 3x spot for a silver medal……as they say in the big house bend over……. LOL. You know my friend Ben Dover? !